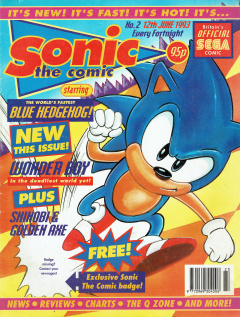 Sonic the Comic 2 is the second issue of the Sonic the Comic series by Fleetway. 1 Sonic the Hedgehog - "Robofox"
Sonic the Hedgehog - "Robofox"
Sonic is still searching for Tails after the events of Sonic the Comic #1, "Enter: Sonic". Sonic the Hedgehog searches the Green Hill Zone for his friend Tails, having just returned from the Marble Zone. However, a young rabbit reveals that Tails was captured, along with everyone else in the Zone, by Dr Robotnik. Sonic puts on a new pair of Power-Grip Trainers (and some sunglasses), then zooms off. He uses his Super-Sonic Spin Attack to defeat some Buzz Bombers and fish-shaped badniks (possibly Choppers or Chop Chops), releasing the captive animals inside. Elsewhere, Robotnik (whose Egg-O-Matic is equipped with the checkerboard-pattern wrecking ball from the first Zone of Sonic 1) is waiting with his new ally: Tails, who is half-covered in a robotic exo-skeleton. When Sonic arrives, Tails attacks him with his own Super-Sonic Spin, and accuses Sonic of playing the big hero while he had to stay in the Green Hill Zone (even though he used to love that Zone). When Sonic is down, Robotnik moves to crush him with his wrecking ball, promising that he will do to the world what he has already done to Tails. At the last minute, Tails remembers that Sonic is his pal and attacks Robotnik, shattering the exo-skeleton and forcing Robotnik to flee. Tails admits feeling guilty for attacking Sonic, while Sonic says that there's no badnik yet made that can beat him. His new trainers are ruined, unable to keep up with him. Sonic and Tails go home. Musashi has infiltrated the fortress of the Neo Zeed assassins, searching for Naoko. He defeats a group of armed warriors, only to learn that Naoko is not in the stronghold: Musashi was lured into a trap. He must now descend through the floors of the pavilion, each one of which is guarded by a martial arts master. He moves to the next level, where an old man is waiting in a darkened room, surrounded by candles. Tyris-Flare and Gilius-Thunderhead have been captured by the sorcerer Blackspell, who wants to sacrifice them in order to resurrect Dark Guld. They are chained in the dungeon. Meanwhile, their companion Ax-Battler wakes up in the village and sets off to rescue them. He reaches the Citadel of Dead Souls at the center of the ruined city of Auropolis. He enters the sewer and finds a lizardman egg chamber. He kills the two lizardmen guards, but not before one sends a warning to Blackspell. Blackspell sends his captain of the guard, Rigia Mortius, to fetch Ax-Battler, and gives her a potion to use on him. Following the events of Wonder Boy in Monster World, Shion the Wonder Boy is attacked by a demon. The demon says that Grimomen, the Demon Lord, could use a fighter like Shion in Demon World. Shion defeats the demon (who disappears when struck by Shion's sword), but learns that he was being distracted while his village was attacked. When he returns, demons have kidnapped all of the villagers except Old Kevin, who hid in a well. Shion catches up to demons' wagons on the coast road at night. He is about to free the captives when he is spotted. When Shion arrives back at the burning village, a stuffed toy on the ground resembles Sonic (but with green shoes and gloves). This page was last edited on 16 April 2018, at 17:16.